To please Jerry, Lucy becomes the referee of his YMCA football team. There is one problem though, she does not know anything about the game. She must now quickly learn to play football. She learns all the signals, but cannot help interfering in her son's behalf. To save face, she offers to take both teams to a pro football game, but a blizzard traps all the boys in Lucy and Viv's house for the weekend. Special Notes: Lucie Arnaz and Desi Arnaz Jr make uncredited guest appearances in this episode. Desi plays #63 on the same team as Jerry & Sherman. Lucie sits between Viv and Chris and is seen sucking on a lollipop. In the pillow fight scene at the end, the child played by Desi Arnaz, Jr. gets to hit Lucy with a pillow. 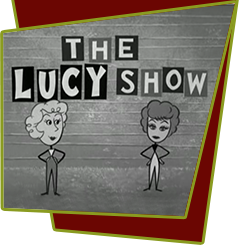 Bloopers: While Lucy and the gang are on the football field, Lucille Ball's canvas director's chair, clearly marked "Lucy" is visible in the background left, behind rival team captain Tony.